Almost every month OHSU Global welcomes students and health care professionals from both BDMS and Siriraj Hospital to explore collaborations with OHSU. This year OHSU Global, with Bella Almario, Nursing Director of Surgery at the Casey Eye institute as the Project Director, is hosting nursing students every month from April to November. In May, two nurses from BDMS did an observership at the OHSU Surgery Department and received training in nursing administration. Not only did they observe an open-heart surgery, but they also experienced their first snowfall on Mt. Hood! The OHSU School of Medicine hosted four medical students from Siriraj Hospital. The students rotated in the Departments of Cardiology, Orthopedics, Radiology, and Emergency Medicine. Find out more about one of their rotations at the Emergency Medicine Department. Dr. John Hunter, former Interim Dean of the School of Medicine, and his wife Laura, hosted all visiting medical students for dinner. OHSU would especially like to thank the host families for hosting these visiting medical students as well as Dr. Hunter and the Faculty of Medicine at OHSU for taking the time to welcome these students to our community. 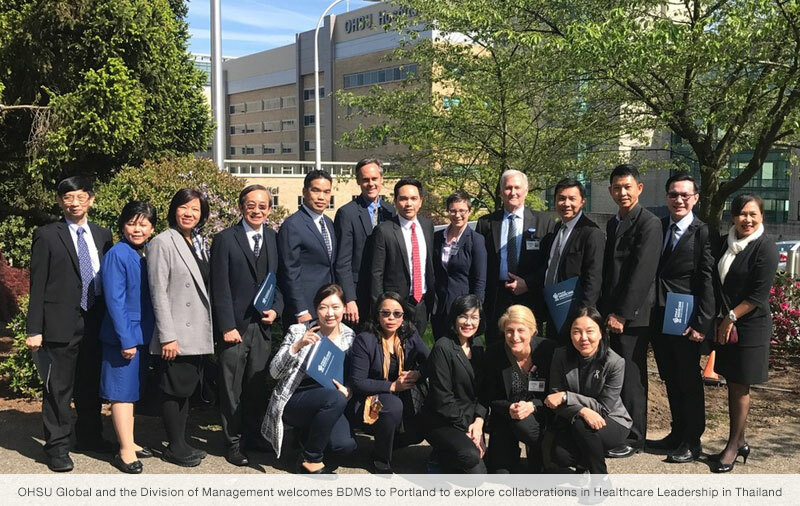 Earlier this month a team of eleven healthcare professionals from BDMS traveled to Portland to visit with OHSU Global and OHSU’s Division of Management. Soon after, Steve Kinder and Jessica Walter from the Division of Management and Judi Workman who is the nursing director of OHSU’s four adult ICUs traveled to Southeast Asia with the OHSU Global team to discuss collaborations in healthcare and nursing leadership with BDMS hospitals.